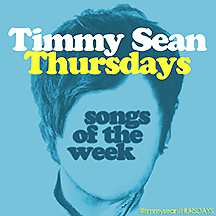 The two latest tracks released as part of his Songs of the Week project continue to prove how important Timmy Sean is to the worlds of pop and rock. When the two genres collide in Timmy’s world, gold falls from the sky. We are proud to be spotlighting Timmy’s work on a regular basis. The 27th song released by Timmy this year is a fiercely realized, soul-tinged pop-rocker. You may remember that a live version of “On and On” was released this past March as one of the Songs of the Week. This is the studio version, a blazing, powerful number pressed into service with a commanding lead vocal, rich backgrounds, and a decidedly Hall and Oates-y vibe. The most recent Song of the Week is another powerful pop-rocker, played in the thumping style of such artists as Ben Folds. “Seventeen” boasts an irresistible melody, pounding drums, an expressive organ part, and a hook that could catch an afternoon’s worth of fish. Once heard, this song will refuse to leave your brain. You’d best not fight the feeling! Add Timmy Sean’s “On and On” to your collection by clicking here. Add Timmy’s “Seventeen” by clicking here. To get all of Timmy’s music, click here. And check back next week for another new Song of the Week! This entry was posted in Timmy Sean's Songs of the Week and tagged "on and on", alan haber, pure pop radio, seventeen, sir video, songs of the week, streamlicensing, timmy sean. Bookmark the permalink. Ready, Set, Go! Pure Pop Radio’s Big Week of Summer Fun Begins Monday, July 13! Pure Pop Radio’s Big Week of Summer Fun Kicks Off Today With New Music, an Exclusive World Premiere, Two Fab Beatles Shows and Timmy Sean’s Latest Song of the Week! Wow!